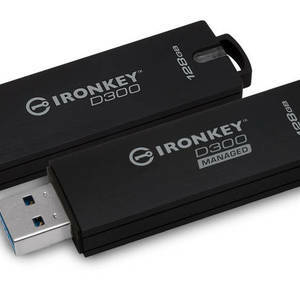 The Kingston IronKey D300 managed encrypted USB flash drive deploys an advanced level of encryption. The product is FIPS 140-2 Level 3 certified, with 256-bit AES hardware encryption in XTS mode. The drive’s exterior is made with a zinc casing and is waterproof to 4′. The interior components are encased in a tamper-evident epoxy seal for physical security. The product employs digitally signed firmware, making it immune to the BadUSB malware, and it enforces complex password protocol with minimum characteristics to prevent unauthorised access. Encryption and decryption is done on the drive with no trace left on the host system and the drive locks down and reformats after 10 invalid attempts, to protect against force attacks. It allows central management of drive access and usage across thousands of drives. It enforces drive-specific policies such as password strength and re-try limits, allowing administrators to remotely disable lost or stolen drives and recover lost passwords. The product offers fast USB 3.0 data transfer rates and is available in 4, 8, 16, 32, 64 and 128 GB capacities. Bitdefender has released it 2017 security software for Windows, Mac OSX and Android. 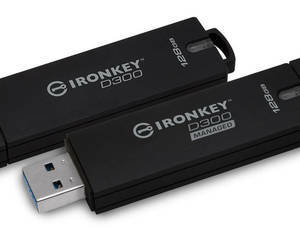 I am interested in Kingston IronKey D300 managed encrypted USB flash drive .